Lazy Seamstress: My sweet dirty faced boy! Dirty faced boy!, originally uploaded by indiaeden. Today Sid and I have been sorting through some of my old sketchbooks looking for inspiration. 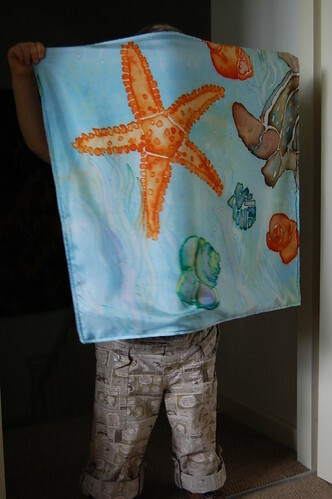 Sid found some collage pieces I'd done of sea creatures and immediately recognised them from some pieces of fabric he had seen in one of my fabric storage boxes. 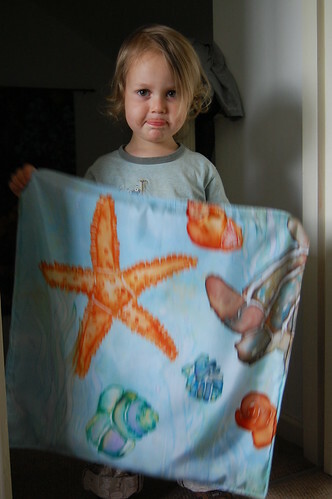 He insisted on getting the fabric out and matching the collage pieces to the shapes on the fabric.We played this game for a while,and then he announced that this small tester piece was his "starfish toy". I was so touched,who knew when I was making these fabrics 18 years ago that they would one day make my youngest child so happy? So here we go,a pale blue minkee backed blankie for Sid.